When saving a script in Applescript Editor, it defaults to the Script file format. The file produced is binary and cannot be indexed by Spotlight. So if I want to search a script based on a word used in the code, I cannot since script code is not indexed. On the other hand I can save as text, but I must remember to change the format option every time! So what is the advantage of saving in Script format and is it possible to make Text the default? Text format files are saved with the extension .applescript and are setup to open by default with the Applescript Editor, same as with .scpt. This has been a goal for many an Applescripter for a long time. Not sure anyone has hit the holly grail without using a third party scripting app with a Spotlight indexer.. I have tried a few things in the past but this thread prompted me again to have another go. I now normally try and save all my applescripts in one places, in a Scripts folder in my Documents folder and also use Hazel to watch place like my Documents folder and desktop for scpt files and move them into the Scripts folder. My new idea is to run a shell script that will be passed a scpt file that is saved in my Normal scripts folder as a normal scpt file and use the shell command osadecompile to decompile and read the file. Then create a text version in my new Script Text folder. 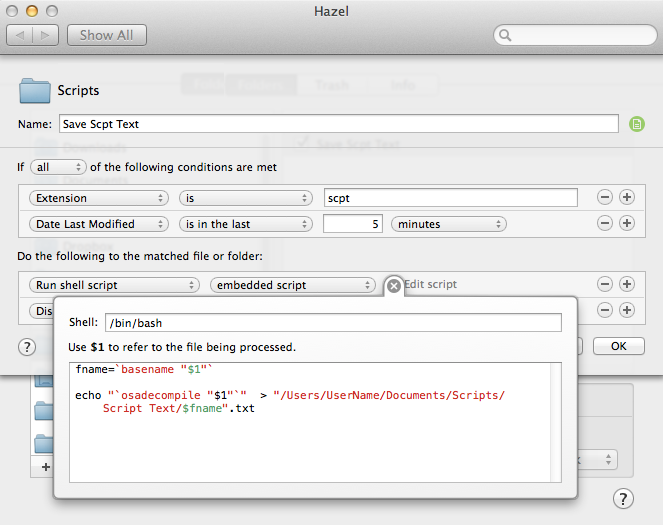 Hazel conveniently uses $1 for the file path of the file being passed. And I use the command basename to get the file name. In Hazel it looks like this. Notice I am using a date last modified condition with 5 minutes. This is to try and catch any edits I do. The nice thing I found is when I find the text file with the code I am looking for, I can either copy the text, refer to it, or find the scpt file easily because I have the same file name in the text file file name. Extension names are meant to be associated with your application of choice. If you change your applescripts to be the default .txt app, you will be either opening up plain text with AppleScript Editor, or opening up applescripts with TextEdit when you double click. Of course you can resort to context menu, but some may consider it an nuisance. To take it further, an user can save all his files without any extension, and scroll through all his applications from Adobe Photoshop to VLC everytime, ad absurdum. In less likely cases, an app needs the extension to know what to do with the file. For instance, TextMate can automatically apply the correct syntax highlight for .scpt files, and BetterTouchTool has an option to "Open Application, File, Apple Script". If the script is saved as .txt, it will be displayed rather than executed. That's my 2 cents. Btw, if you cannot change the default save option, you can always create a macro with say Keyboard Maestro, and bind it to keyboard shortcut CMD+S. This way, the default save operation will be overridden by your custom sequence of actions that changes the file type.